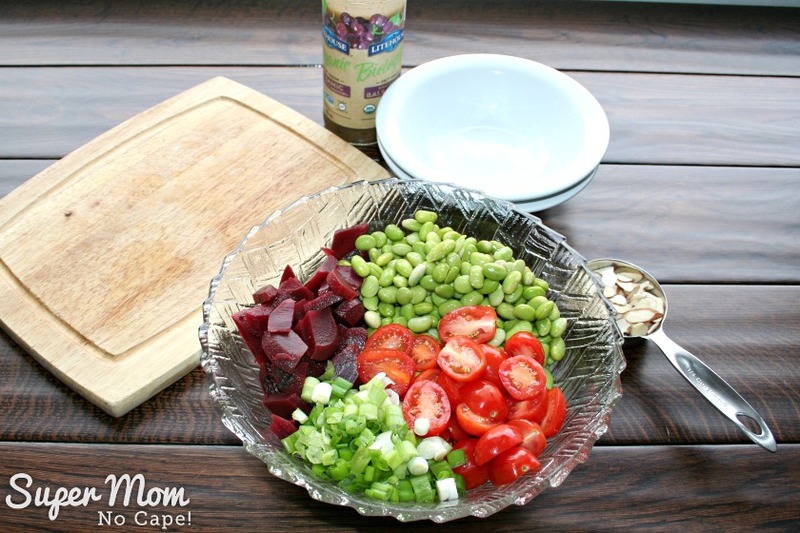 Beet and Edamame Salad - A Simple, Quick and Delicious Recipes! If you’re like me, there are times when you want a salad that can be thrown together quickly and on the table in the time it takes to make the rest of the meal. 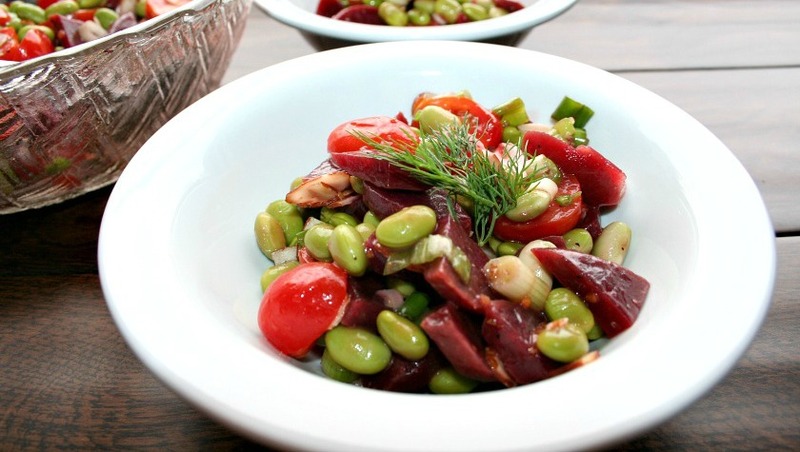 This Beet and Edamame Salad fits the bill! As well, when cooking for two it can be challenging to find recipes where you don’t end up with enough food that you’re eating leftovers for a week. Our family’s all time favorite salad is Potato Salad to Feed a Crowd followed closely by Hawaiian Macaroni Salad but both recipes make a huge salad which is a lot for two people to use up without having to include them in every meal for several days. And for them to taste their best, they need to be made several hours ahead of time. For best flavor, I make them the night before. 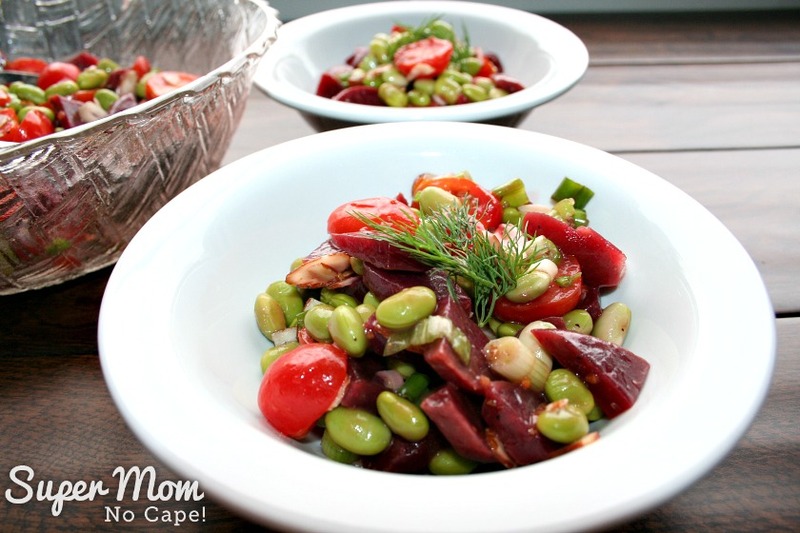 True, the edamame for the Beet and Edamame Salad will need to be cooked and cooled but you could do this any time during the day when you have a few minutes. They hardly take any time at all to cook. Or make them the night before and have them in the fridge. You could also cook and flash cool them by putting them in a bowl of ice after draining. So this really is a quick recipe to get on the table. If you haven’t already done so, cook, drain and cool the edamame. Cut the sliced beets into quarters. Chop the green onions and slice the cherry tomatoes in half. 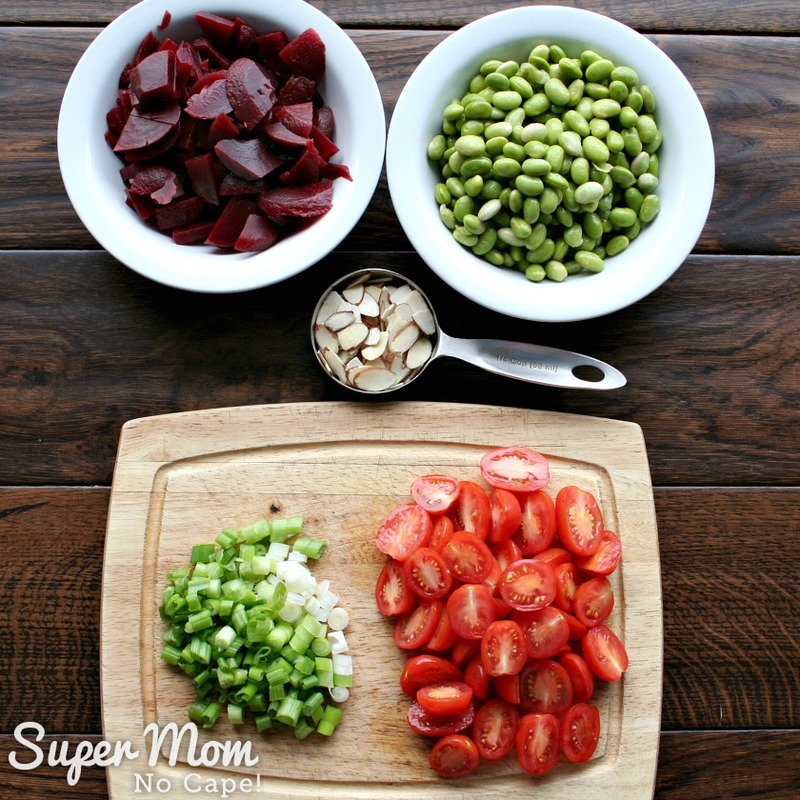 Add the beets, edamame, green onions and tomatoes to a bowl. 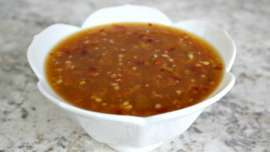 Add 2 to 3 tablespoons of balsamic vinaigrette. Lightly toss to combine the ingredients. Allow the salad to sit and marinate while the rest of the meal is cooking. Add slivered almonds right before serving and toss to combine. 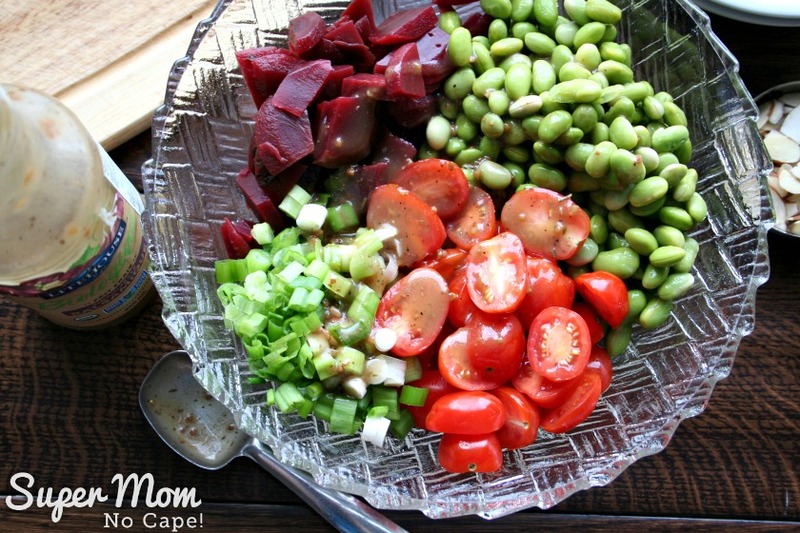 This Beet and Edamame Salad is so delicious! Here I’ve served it in individual bowls topped with a sprig of fresh dill weed. The salad has a clean, fresh taste, making it one you’ll want to add to your list of quick and easy spring and summer salads! 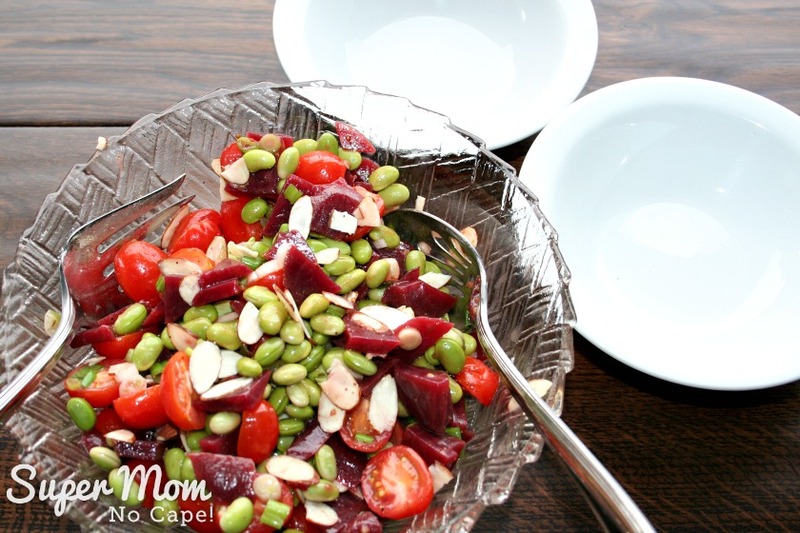 The original version of Beet and Edamame Salad was one I found online several years ago. It looked so good and fit into my low GL eating plan while at the same time being a dish that Dave would enjoy eating too. Canned beets were substituted for the roasted beets. The original called for adding crumbled goat cheese but I didn’t want to buy a package of goat cheese just to use a small portion of it in this recipe, so I chose not to add cheese at all. I had slivered almonds on hand. Those replaced the chopped whole almonds. I almost always have a bottle of balsamic vinaigrette in the fridge so I used that for the dressing. When you find a recipe online, don’t be afraid to adjust it to make it fit your needs. If you like balsamic vinegar as much as our family does, you might also like to try my Broccoli Salad with Balsamic Mayo Dressing. 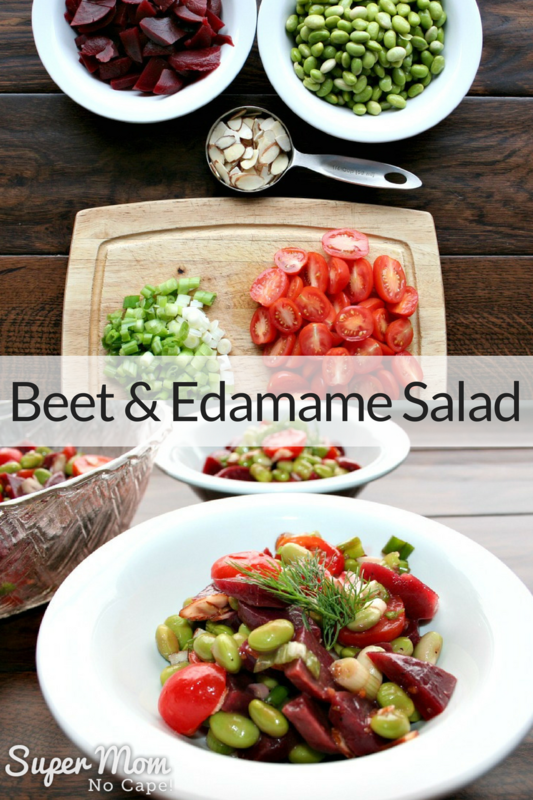 It’s as quick and easy to make as the Beet and Edamame Salad and just as tasty. 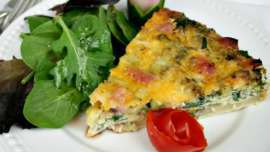 It’s another recipe where I made adjustments to the ingredients to make it work for what I had on hand and our family’s like, dislikes and dietary restrictions. 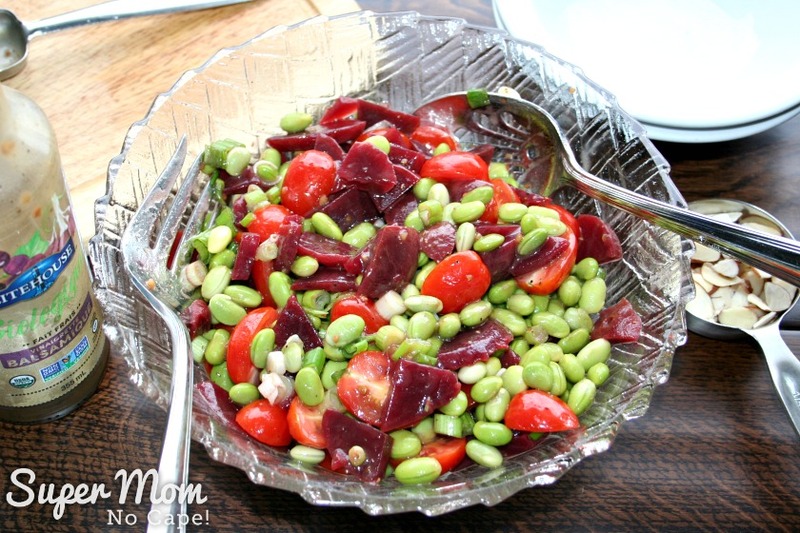 Pin this recipe for Beet and Edamame Salad for future reference by clicking on the Pinterest button underneath this post. This post was first published on Super Mom – No Cape in March of 2013. It has been updated with all new photos and more detailed instructions. I can see why you pinned this–it looks great. I will certainly try this. Thanks for sharing it! I’ve noticed we keep being told that households are shrinking, but neither recipes nor grocery shop quantities are doing so… No wonder food wastage is so high! This is a delicious looking salad. I love beats and edamame, although I am careful not to overdo soy based meals. Nice photography also makes this recipe all the more appealing! 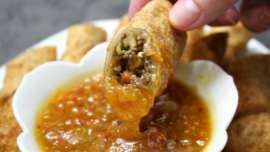 I think I am going to give it a go for lunch today! This looks really really delicious. I have to try this and I will be using canned beets instead of the roasted. Pinning and thanks.